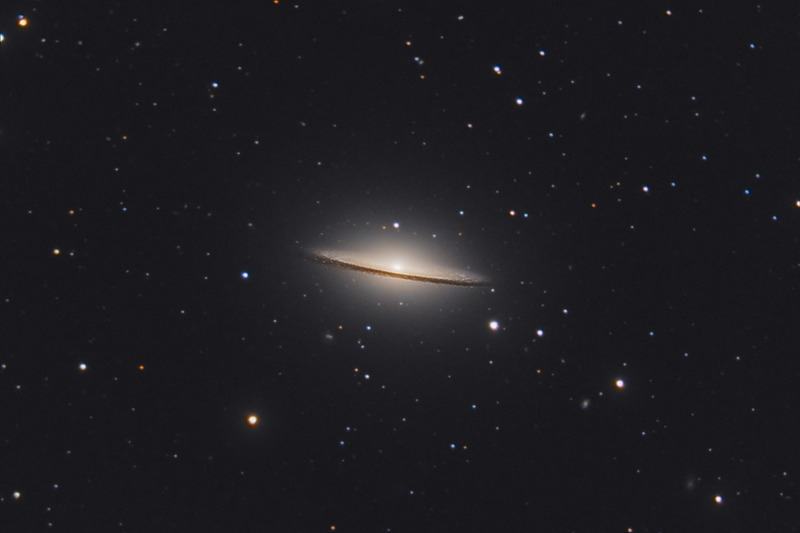 M104 is a distinctive galaxy in that the combination of its large central bulge, and prominent dust lane give it the appearance of a sombrero. M104 is known to have a large central supermassive black hole (as may be common in many galaxies). It is also renowned for having a large number of globular clusters - probably around 1200. This field of view also has a good collection of very small background galaxies. Be sure to click on the image to see these nice galaxies in the enlarged frame. In this image, North is Up. This image is cropped to 40% of the original full frame. Software Used Images Plus 4.5 for camera control, calibration, stacking, digital development, deconvolution, multiresolution sharpening, smoothing and noise reduction. Photoshop CS5 used for levels and curves, color balance, high pass filter, star shrinking, saturation adjustments, color channel alignment, screen mask invert, and noise reduction. Gradient Xterminator for gradient removal. Carboni Tools for additional saturation adjustments, noise reduction, and smoothing. HLVG for additional color correction. Focus Magic for focus restoration. Notes I had photographed this galaxy last year and had some poor results due to soft focus. 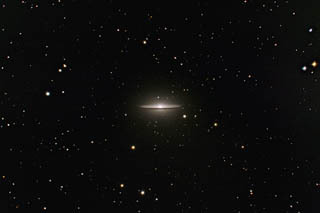 I was lucky enough to have excellent conditions this year, which is most critical for imaging the Sombrero Galaxy. M104 is at a relatively southern declination of -12 degrees, so it never rises above 44 degrees in altitude at my house. Additionally, much of the time I was photographing it, it was very low in the sky (30 degrees or less). With the excellent conditions, I was fortunate enough to capture some very nice and fine details in the galaxy. This image won 1st place in Cloudy Night's May 2012 DSLR Challenge contest.